Mid Bloomer. Clustered flowers, blue to reddish purple, plant covered with silky hairs, sometimes has a grape-like fragrance. Notes: Pea Family. 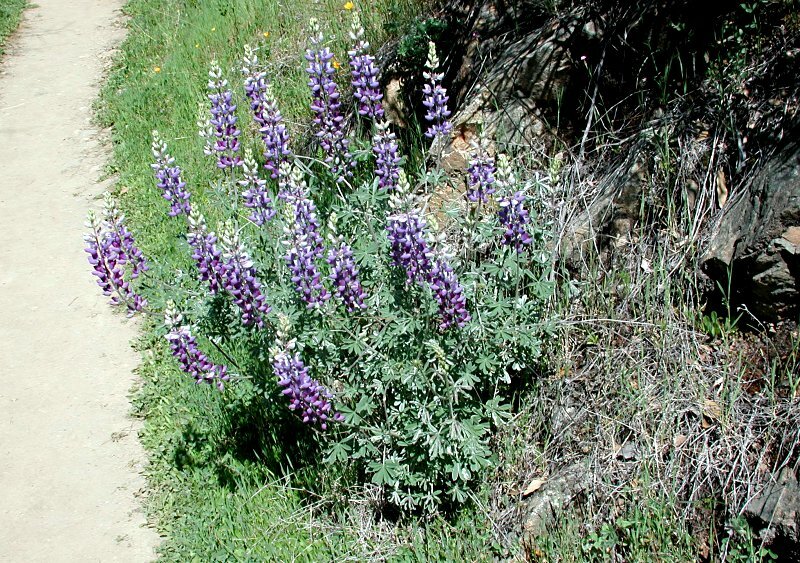 This is the only shrubby Lupine in the foothills, with beautiful wands of blue-violet flowers and silver foliage, therefore also called Silver Lupine. Almost every part of this plant is covered with fine, silvery-white hairs. Albifrons means ‘white-fronded.’ The flowers can occasionally give off a grape-like fragrance. The black-flecked patch on the blossoms turns red with age. Click on the species name to jump to USDA for this plant. Species Lupinus albifrons Benth. ex Lindl.